Two decades back,when a boy,13 years of age with parents in tow,hesitantly walked into St.Joseph's Boys School principal Fr Dennis Coelho's office to seek permission to skip classes for a few days,little did any of them guess that they were at the crossroads of history.Rahul had been selected to play for Karnataka in the South Zone under-15 cricket tournament in Andhra Pradesh.His school was always more concerned about academics.Rahul's father Sharad Dravid said-"We will comply by school regulation.Rahul would attend school rather than go to Andhra for tournament." Father Coelho replied,"No.Let him go and play.He is embarking on a great adventure.Schooling can wait." Principal's reply was turning point in the making of cricketer Rahul Dravid.The journey continues, but the shy boy,more than 20 years back is now one of the toughest cricketers in the world cricket.His impeccable technique along with sheer mental toughness wears down the best of the opponents. Dravid's remarkable ability from a very young age was converting disadvantages into opportuinities.The Bangalore of his youthful days did not boast of too many turf pitches.Almost all matches at school,college,club and even senior division league level were all played on coir matting pitches.Batting on these pitches had many disadvantages.It was not the most conducive of pitches to hone your skills as a batsman.But,on the plus side,the bounce on these pitches would be higher.The batsman had to reckon with this all the time.Dravid was fortunate to have pace bowlers of the caliber of Javagal Srinath,Doda Ganesh and David Johnson.He would ask the bowlers for imaginary field placements and concentrate on each and every delievery.Soon everybodt realised that he was a man with a mission. Good in academics in his schooling days,Dravid throughout his career has been a keen student of the game.The Karnataka batter belongs to the school of thought which believes in meticulous preparation for the task ahead. Mock batting used to be one of such experiment in Rahul's arsenal.He would take strike on KSCA Stadium's lower tier pavillion rack and have another cricketer throw a wet cricket ball from a higher step.This would replicate the steep bounce that he could expect in Australia and South Africa.Initially,he would take stance without a bat in hand and concentrate only on weaving in and out of line of the skidding tennis ball.Later,he would use a willow to defend.The wet tennis ball,hurled from about 10 to 12 yards would skid and climb alarmingly.But Dravid would always be in a position to defend it or weave out of line.This sort of meticulous preparation has always kept him one step ahead of the opposition bowlers. thanks mr. 4 ur valuable info. Its a great feeling to know that I am communicating with someone who's played with Dravid in Karnataka team so that makes me 2 degrees from Dravid! I have complete respect for Dravid, his style, his thoughts and everything. Most people in my family worship Sachin and respect Dravid. Although I like Sachin too, I am more of a Dravid and his personality's fan. 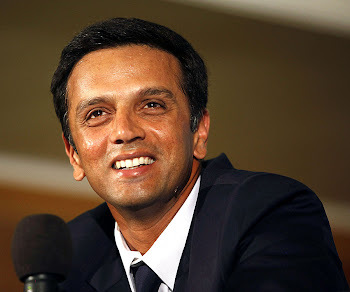 Dravid i believe you will play the next world cup and prove the you mr.dependeble. please I am eagerly waiting to see him in blue and play as one of the class players. Same here.Our whole family has a lot of respect for Dravid, not just because he is a good player, but he is also a great human being. Let's hope his team wins IPL 2009. But I don't think he will get a chance to play WC 2011. Wishing Rahul a very Happy Birthday and a great year ahead. Hopefully he gets back into his peak form and shut the mouth of his critisers. All my wishes and prayers for his future.